Take a deep breath and exhale. Do you know what exactly is in the air you’ve just breathed in? How can you even measure what’s in the air around you, let alone have it give you an idea of the past? That’s what an international team of highly specialised scientists and engineers are doing in an exciting Antarctic project, including one of our own David Etheridge, who is the Co-chief Investigator. They are researching the history of a compound called hydroxyl. Hydroxyl is a powerful oxidant and a natural ‘air purifier’ found in the atmosphere. It breaks down and cleans the air of greenhouse gases, like methane, and industrial chemicals that deplete the ozone layer. “We’re looking to understand how much of these pollutants have been removed naturally by hydroxyl and whether the amount of hydroxyl in our atmosphere has changed since pre-industrial times, more than 140 years ago,” said David. After six years of planning and three months working in one of the most remote and inhospitable places on Earth, the team is one step closer to achieving what was once considered an impossible task. Measuring hydroxyl on its own is no easy task. Hydroxyl radicals are so reactive that each molecule lasts less than a second before it reacts with a compound. This makes it impossible to sample directly. And measuring hydroxyl in 140-year-old air is almost impossible. The researchers will instead measure tracer molecules, such as carbon-14 monoxide (14CO). This acts as a measurable proxy for hydroxyl and also gives a meaningful average level for hydroxyl within the atmosphere. 14CO is removed from the atmosphere by hydroxyl so the amount that remains in the atmosphere tells us about the hydroxyl levels. “However, the 14CO tracer molecule isn’t easy to measure either. There’s only a very small amount of it in the Earth’s entire atmosphere – about 10 kilograms or less in total. So measuring 14CO is a bit like finding a particular grain of sand on an entire beach,” said David. 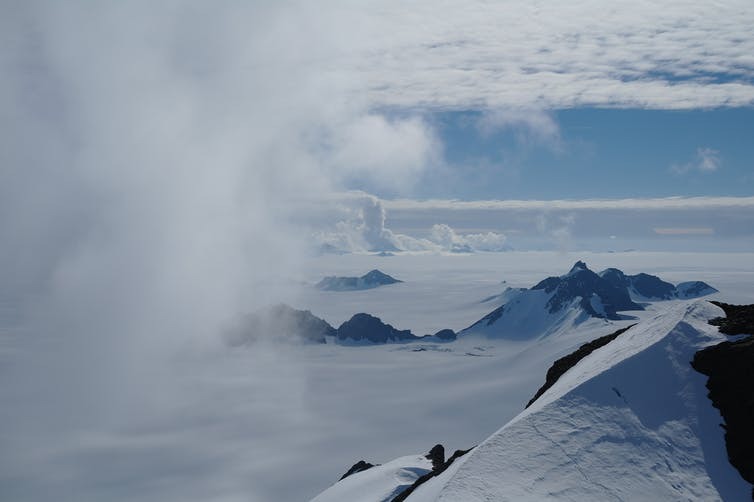 Antarctic ice may not be the first place you’d think to hunt for clues about atmospheric changes. But David and team know that the only place where we can look back to past atmospheres, before direct measurements began, is the air captured in ice. Now take Law Dome in Antarctica, a site 130km from Australia’s Casey research station that has long been studied by the Australian Antarctic Program. It is a unique place, with very high snowfall. This rate of snowfall traps air and buries it at depth quickly where it is preserved in the ice for centuries. Because of this, it’s the only known place on the planet where we can search for past hydroxyl levels. By drilling deep (up to 240 metres deep!) into the ice and then melting the ice cores, scientists can extract bubbles of air that were trapped as far back as the late 1800s. This means we can sample the atmosphere from pre-industrial times, before increases in greenhouse gas emissions from human activity began. So how did the team begin the process of measuring tiny concentrations of 14CO to measure hydroxyl? 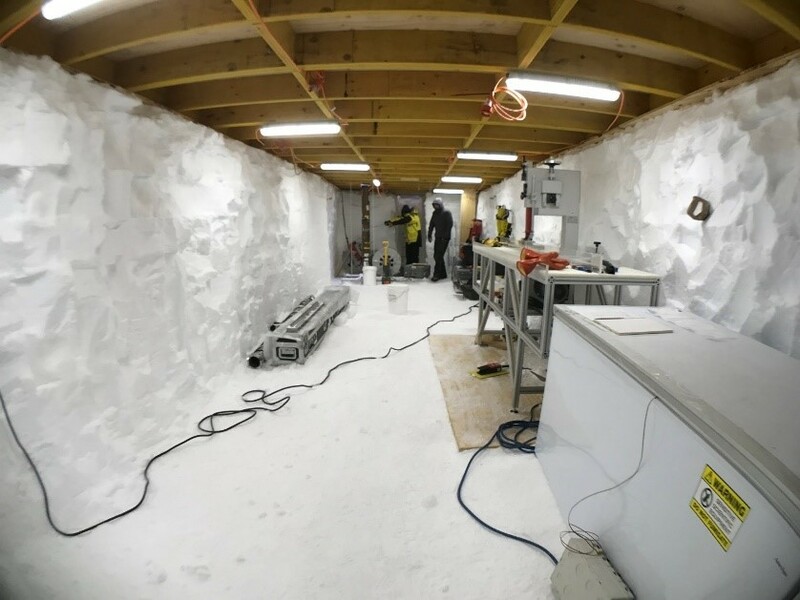 The team extracted 0.5 tonnes of ice for each sample and used three different ice drills from US Ice Drilling Program, including one installed in a specially prepared trench. The ice had to be melted at the site to extract the air bubbles containing the precious 14CO. 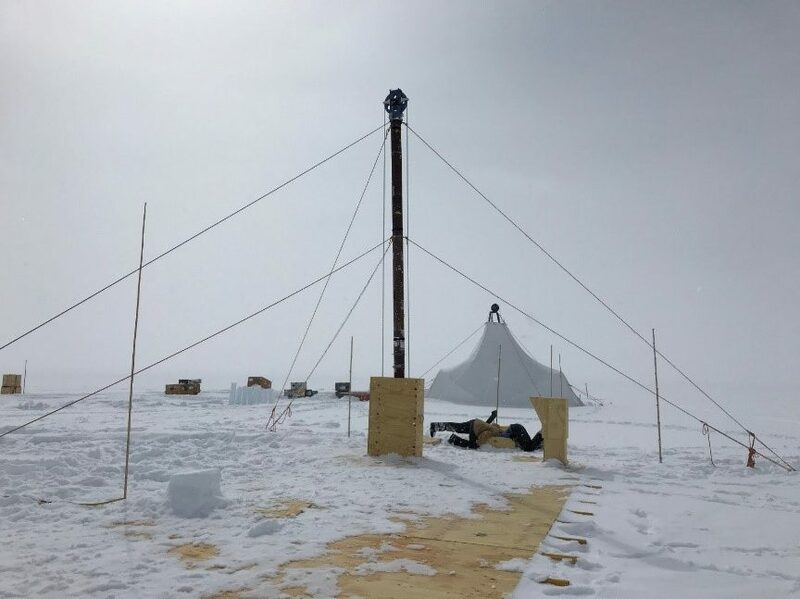 This process had to be done within 24 hours of the core being brought to the surface as 14CO is not only rare, but also highly sensitive to cosmic rays (which can penetrate metres of rock, let alone centimetres of ice). One half -tonne of melted ice resulted in 50 litres of air, in which the concentration of 14CO tracer molecules will be a few parts per 1019 molecules of air. 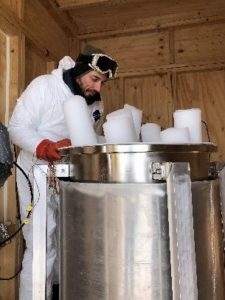 CSIRO scientist David Thornton had an extended stay at Law Dome preparing the ice cores for melting extraction and sub-sampling them for other gases too. Now that the team has returned from their three-month expedition, they can start to see what this ancient air tells us. These precious air samples are now journeying by ship to the University of Rochester in the United States, where the US team members will use a highly specialised technique to extract the CO from the air and convert it to CO2. The samples need to be transported by sea as air transportation would increase their susceptibility to those cosmic rays we mentioned earlier, which could irreversibly alter them. Each sample will then return to Australia in a small ampule, where a team at the Australian Nuclear Science and Technology Organisation (ANSTO) in Sydney will turn the CO2 into about 10 micrograms of graphite. From here, the 14CO can be measured to reveal any historic changes in the concentration of hydroxyl in the atmosphere. “It’s a huge achievement just to get this far,” David said. It may be a small and fleeting compound, but if we know more about how hydroxyl removes pollutants from our atmosphere, we can improve our global climate models. And from this, we can gain ice-borne insights into the future levels of greenhouse gases and ozone-depleting gases that affect our planet. The project was supported by the Australian Antarctic Division (AAD), Australian Nuclear Science and Technology Organisation (ANSTO), University of Rochester and the US National Science Foundation. Our atmospheric research got you hot under the collar? It’s a bird… it’s a plane… it’s citizen science! I’m sorry, could you please explain this concept of hydroxyl further? Do you in fact mean hydroxyl radical? As I find the use of the work Hydroxyl alone in defining a compound rather misleading. So much science rests on imaginative engineering and technical innovation like this. A really impressive sequence of steps to generate sufficient data to churn into meaningful information. Looking forward to the reports. How does the hydroxyl ‘clean’ the atmosphere ? what does it do with the molecules carbon di/mon oxide, methane etc having ‘removed ‘ them ? where do the molecules go ? (assuming that matter is neither created or destroyed). Most interesting article. I like the pictures, how do you get out of a tent that’s had a metre and a half of snow dumped on it since you went to bed ? wouldn’t it be easier just to sleep in the makeshift lab ? what do you do about going to the toilet ? Hydroxyl “cleans” the atmosphere by oxidising reduced or partially oxidised molecules like methane (CH4), which usually produces compounds that are deposited, like formadehyde or eventually carbon dioxide (CO2) in small amounts. This doesn’t make the gases disappear, but removes them from the atmosphere where they would otherwise affect air quality, climate or the stratospheric ozone layer, or makes them less active at absorbing heat. 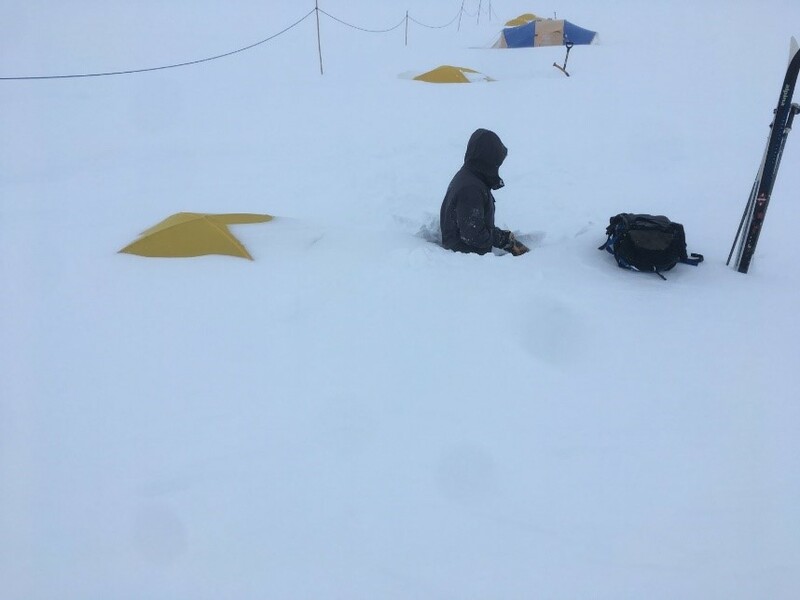 As for the pictures, in extremely snowy weather it’s a good idea to have a small shovel near the exit of the tent to help dig out. Recently fallen snow is usually pretty light and can be removed easily. A bit of exercise and cold snow in the face is a good way to wake up! (But not every day please!). It’s nice to have a bit of your own space when working and living in field camps like this. There’s toilet (can with bag, not flushing) in the generator caravan. I think you guys are amazing geniuses and I thank you for your years of study and effort to go to Antarctica to do this fantastic service to the world.